Good day to you! 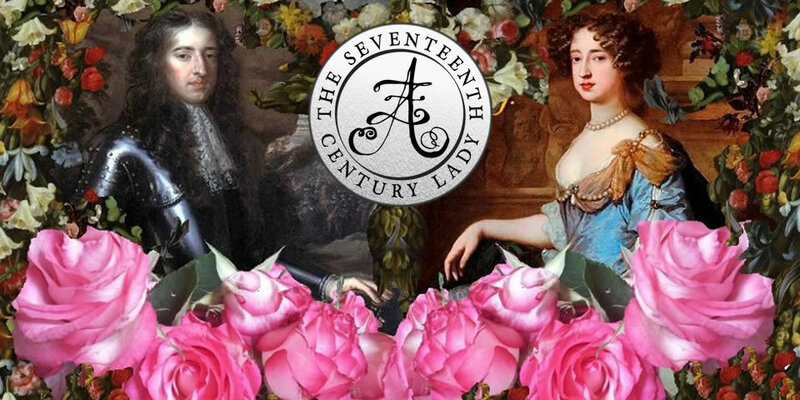 Today we have Art Historian Alison Lodge as our guest writer on The Seventeenth Century Lady! I’ve known Alison for several years now on Twitter, where she mainly tweets about 18th-century topics. 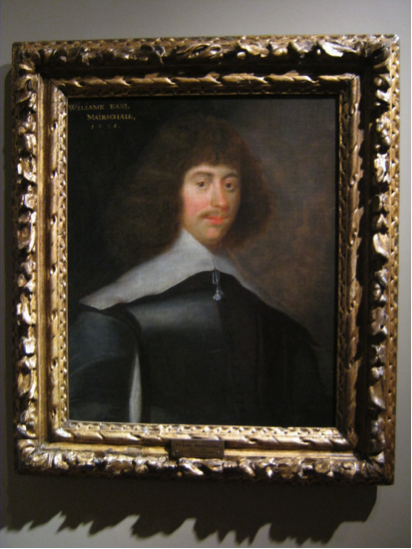 Today, however, she’s in our century with a wonderful, fact-filled post on George Jamesone: The Scottish Van Dyck! It was when I began working for Castle Fraser, Aberdeenshire some years ago I became interested in many of the portraits there, but in particular Andrew, 1st Lord Fraser and his wife – allegedly by an artist I was told, called George Jamesone an Aberdonian – but who was George Jamesone and were these portraits by him or not? This is a journey that I am still travelling to the present day, still seeking more examples of his work. 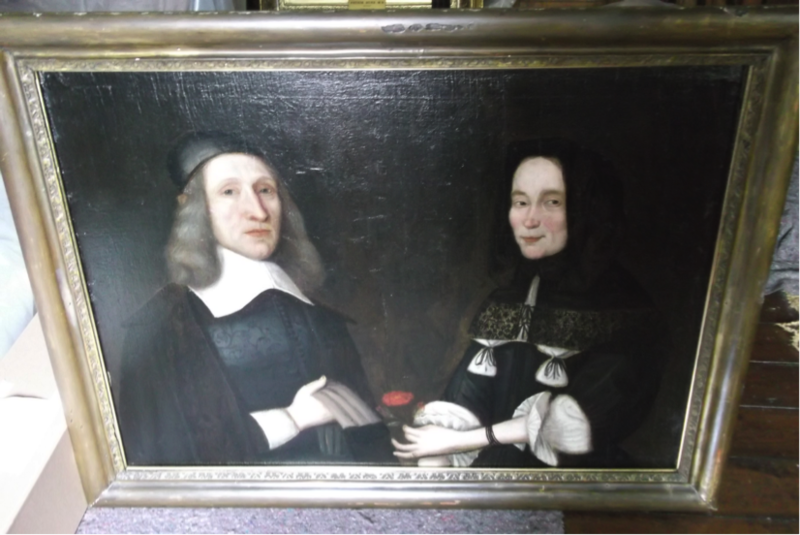 After reading what little information I could find, and identifying other properties in the local area with portraits it then became, for me, the question of how could the first native-born Scottish portrait painter be largely forgotten? Luckily, when I first began to look into the whereabouts of other local examples of his work the BBC Your Paintings website had come online showing images of those in public collections where available. 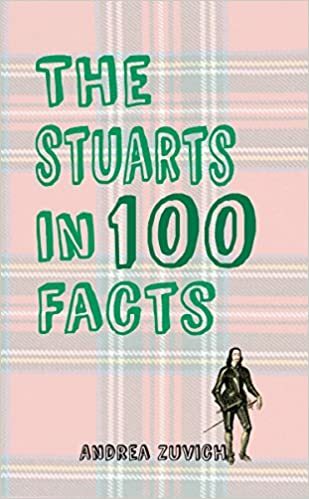 The best, and in fact only recent book on George Jamesone by Duncan Thomson gives an in depth biography and genealogy, and it is possible to tell that Jamesone was born in the City of Aberdeen as near as can be told since there is no baptismal record between the autumn of 1589 to the summer of 1590. This can be roughly worked out when looking at the baptisms of his siblings. 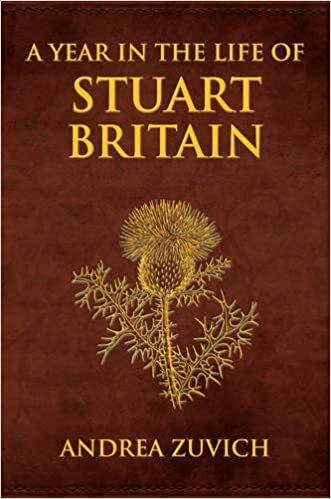 There is also the notebooks and genealogical research of another Aberdonian, John Bulloch, whose work I consulted at the University of Aberdeen’s Special Collections. 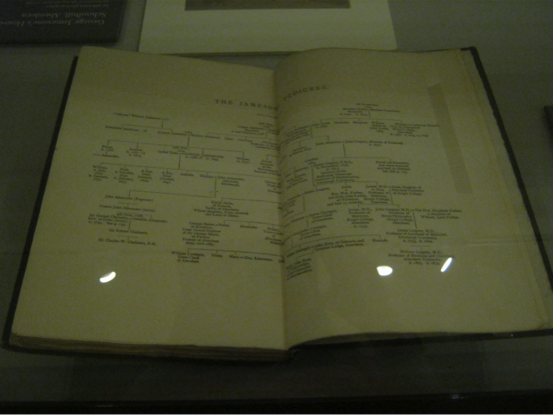 John Bulloch’s genealogical research shown in his book on George Jamesone. George was the third son of Andrew Jamesone, Master Mason or Architect as he is variously described in contemporary documents, and his wife Marjory Anderson, who were married on the 7 August 1585 in Aberdeen. They are both from long, well established and very prosperous families that city. The Jamesones first child was the only daughter Elspeth, baptized on the 30 July 1586, the three other sons were Andrew c 1587 and David baptized 17 October 1588, who died before 1607 and in 1613 respectively, and William baptized 9 May 1591 practised as a lawyer in Edinburgh, dying in 1632. As George originally had two older brothers he was unlikely to inherit much of the property owned by his father, but eventually was left beneficiary in 1607 of the house to the north of Schoolhill, later famously known as Jamesone’s House that had been purchased by his father in May 1586. 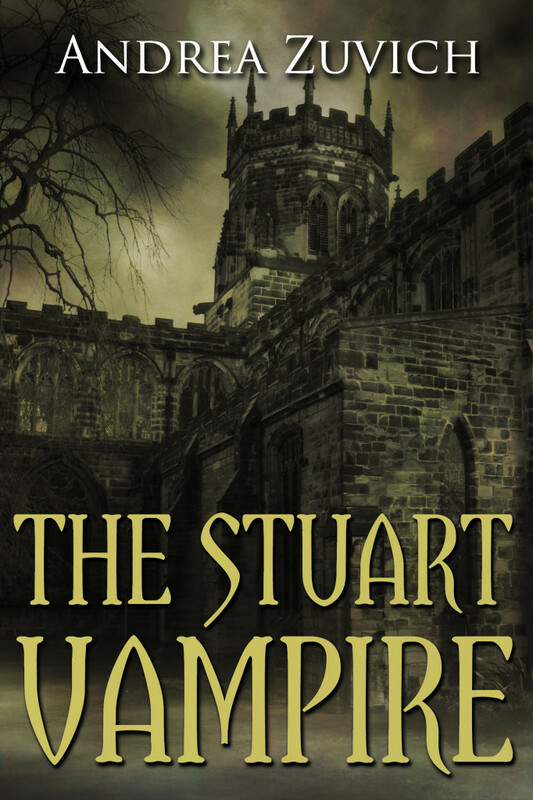 After his brother William’s early death, George was to be the sole survivor of the family and the sole beneficiary of all of the family’s wealth and properties including that of the Schoolhill property. 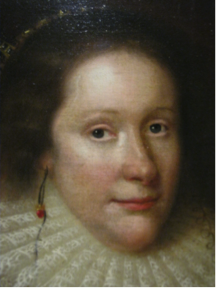 Andrew Jamesone died around 1612, and after finishing his apprenticeship in Aberdeen in about 1617, George Jamesone disappears for a while, not appearing in records in Scotland again until 1620, becoming an established portrait painter in Aberdeen in the mid/late 1620s. George was then able to marry Isobel Tosche, possibly on the 12 November 1624 in the Aberdeen Burgh records, though as it is listed as a ‘promise of marriage’ it may be that the couple married as late as 1627. Isobel went on to give birth to a total of 9 children at least, 5 sons and 4 daughters. Unfortunately, none of their sons were to survive to adulthood, and only 3 daughters are named in the will made in 1641 as surviving their father. 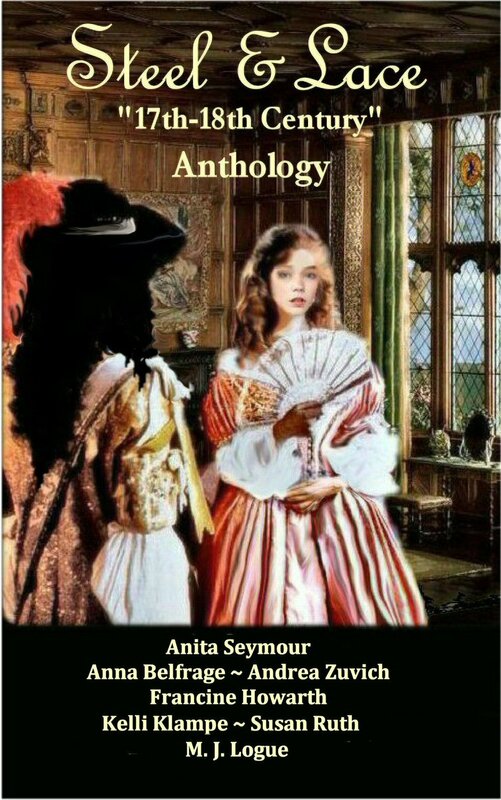 There is also some suggestion that the third daughter mentioned – Elizabeth was in fact a ‘natural’ or illegitimate child of Jamesone’s, though no firm evidence has yet been found for this, and of the three daughters left living at the time of his death – Marjory and Mary, Elizabeth does not inherit anything from her father. This would appear to be very unusual and go some way to proving that she was not the daughter of Jamesone. It is also a possibility that the other ‘child’ could be the illegitimate granddaughter of Jamesone and thus still unable to inherit. As he came from a reasonably well to do trade family that were skilled, and increasingly landowners and moneyed, it is thought that young George was able to be provided with a good education and to attend Aberdeen Grammar School. He later attended Marischal College, part of the University of Aberdeen where he became friends with Arthur Johnston. His links as an alumni to the University would later gain him work, as he painted Johnston at least twice along with other academics including Johnston’s brother William. All three of these portraits still belong to the University of Aberdeen, and two of them are currently on display. 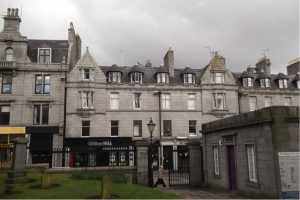 Today, it is difficult to imagine the tower house style building that occupied the site of what is now known as 22 Schoolhill, Aberdeen. Long the property of the Jamesone family, and latterly in the possession of George and his daughters, it was certainly magnificent and spoke volumes of the well to do nature of the family. Sadly, Jamesone’s House was demolished in 1886 during major works in Aberdeen to improve the area. By this time it had become rather dilapidated, but still it was greatly mourned by those who had cherished it. There survive some photographs at Aberdeen Art Gallery which show its close proximity to the kirkyard of St. Nicholas and the fact that the turret roofs had been removed, the windows altered slightly over the years and the fact that it looked in great disrepair. At this time, it is only possible to see two wall plaques between the somewhat strange combination of a betting shop and a cake shop! 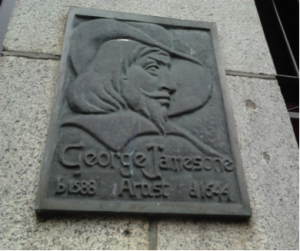 One is to Jamesone himself, with an image typically George (though slightly Guy Fawkes-esque) bearded and wearing his wide brimmed hat, as all of his self-portraits were. Interestingly, the house faced St. Nicholas Kirk – but to date I have found no trace of markers for Jamesone graves there. In 1612 George began an 8-year apprenticeship as a painter in Edinburgh, interestingly not an apprenticeship as a mason. Perhaps his father had plans for this occupation for another of his sons. 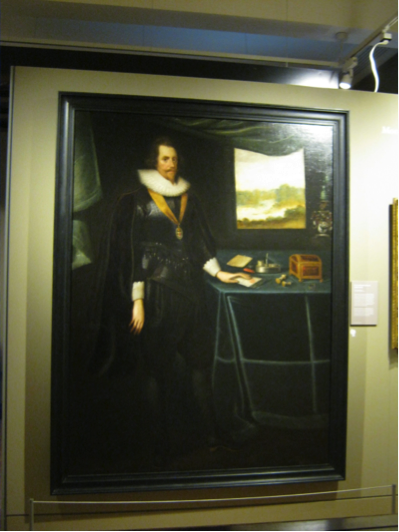 By 1617, he is no longer bound to this, but is apprenticed to a new master – John Anderson, a decorative painter and possibly a relation of his mother’s. It has been suggested for many years that in between 1617-1620 that he could have been apprenticed to the famous artist Peter Paul Rubens, but no evidence has been found to support this. 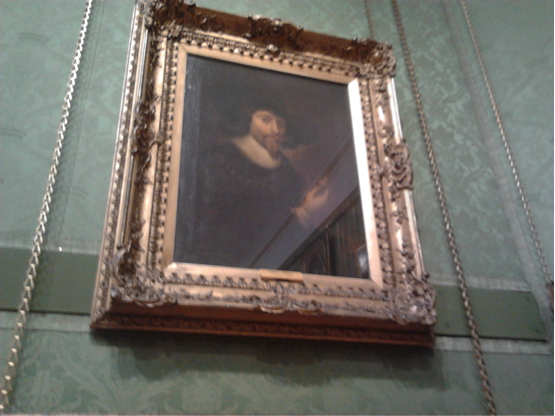 It is how George gets the title of the ‘Scottish Van Dyck’ however. 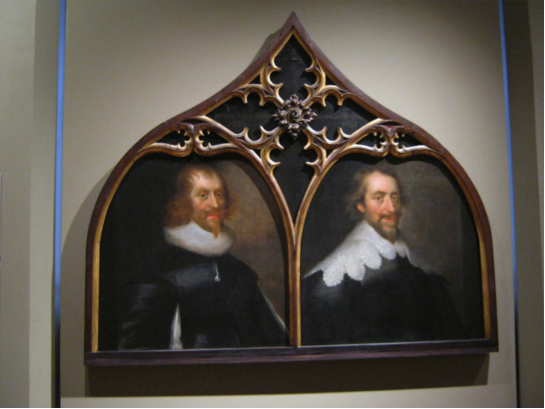 Horace Walpole first dubs Jamesone this when writing his Anecdotes of Painting in the 18th Century due to not only Rubens, but also the suggestion that he was an apprentice at the same time as another portrait artist Anthony Van Dyck. Aside from the rumours surrounding Jamesone’s training, fortunately for the researcher a great number of portraits for such an early artist as Jamesone are still available in public collections that are possible to see, mostly in Scotland. Indeed, in 2013 a series of rooms at the Portrait Gallery in Edinburgh, part of the National Galleries had a series of rooms devoted solely to Jamesone’s work – and it is probably the best work. …and a close up of the Countess of Rothes the other full-length portrait with her daughters. The background paintings echo the studio of Jamesone. 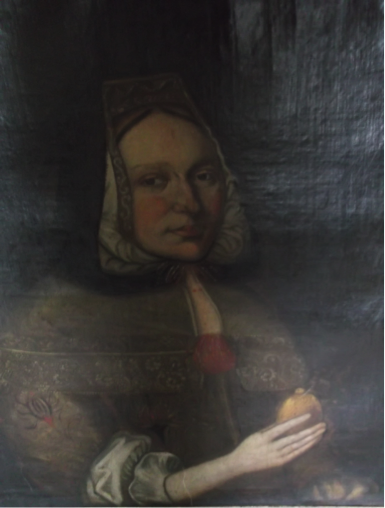 Jamesone’s early patrons in the 1620s and especially at the time of the birth of his children were local Aberdonians – and he knew many of them via the University of Aberdeen – these were Arthur Johnston and his brother William, Sir Paul Menzies, and James Sandilands. 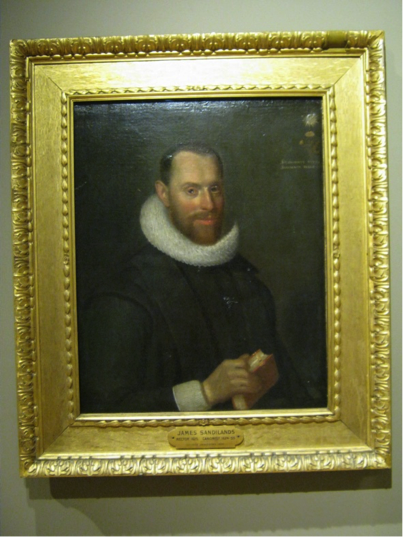 These portraits still remain in the University’s collection. Arthur Johnston, a famous Latin poet even wrote about Jamesone himself. 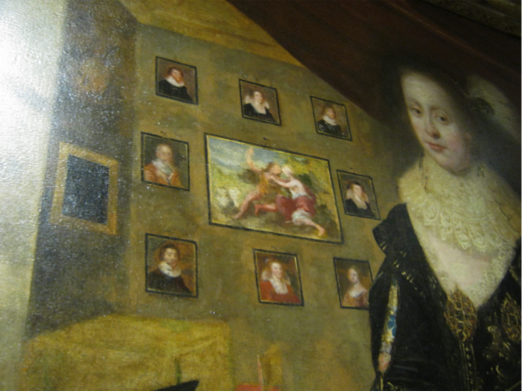 The Erskine family were also to become important have several large-scale, detailed portraits made. Towards the end of 1634, Sir Colin Campbell of the Campbells of Breadalbane was to be a major patron at the same time as Jamesone’s work on the coronation, even going so far to have Jamesone re-create/imagine portraits of long deceased ancestors and indeed create the very famous Campbell of Glenorchy family tree, a very unusual piece of work. 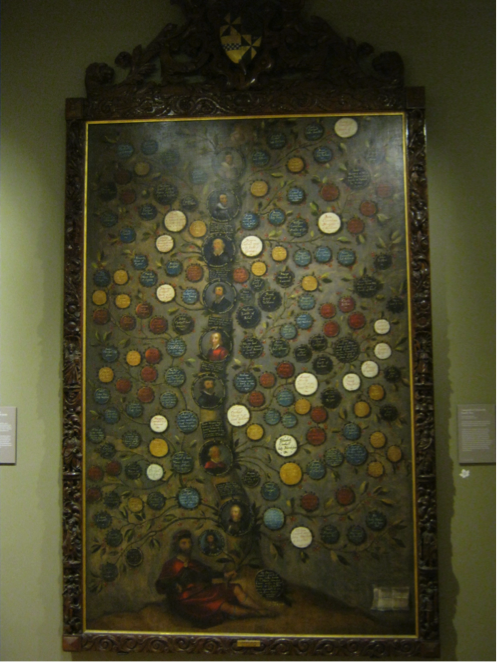 It is thought that Campbell commissioned these pieces in response to Jamesone’s most famous of all patrons – the King. 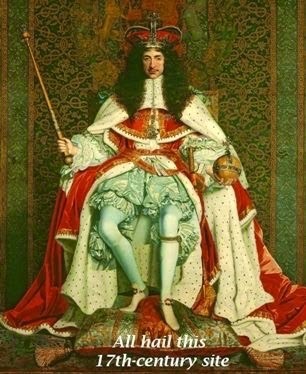 In June of 1633 Charles I was to finally have a Scottish coronation. Jamesone was chosen by the Council of Edinburgh to create and possibly commission 109 artworks of the King’s ancestors – as not all of the portraits were necessarily by him – to line a triumphal arch set just after the Tolbooth in Edinburgh. 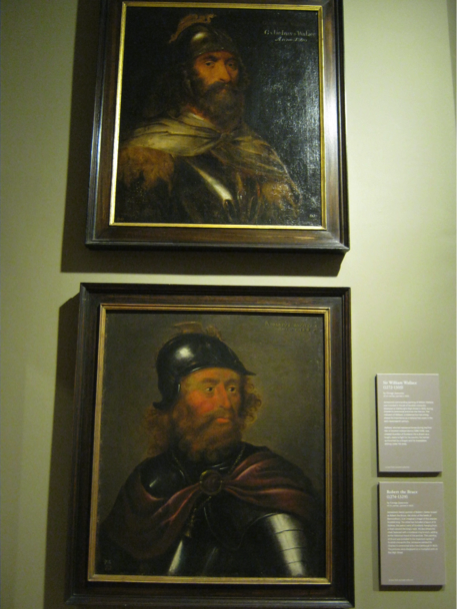 26 of the portraits still survive and several of them were recently on display at the Portrait Gallery in Edinburgh, 7 were formerly in the care of New Battle Abbey until recently. 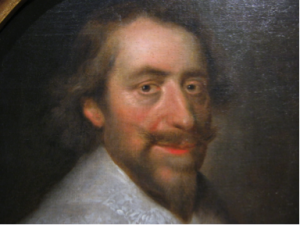 The King was understandably delighted, and as an art collector himself must have seen Jamesone’s potential. 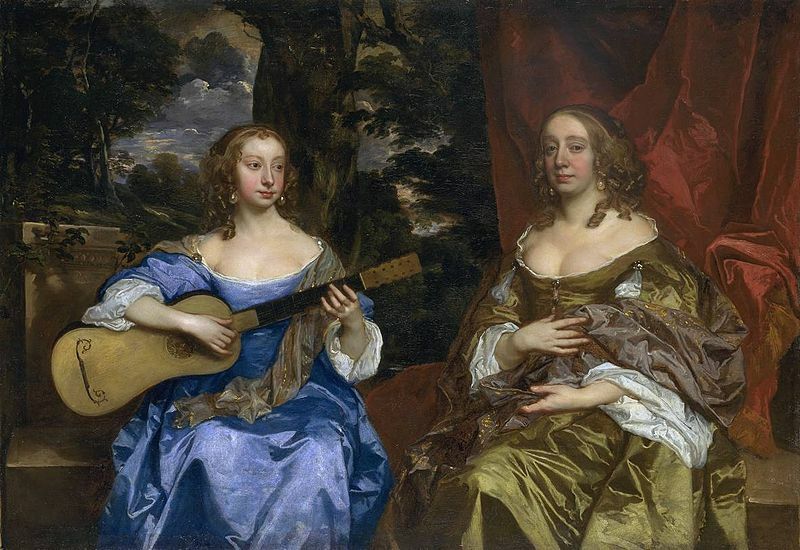 Portraits of Charles I and his wife Henrietta Maria were later commissioned, and Jamesone’s future career was assured. Jamesone’s luck was not to last, and in the last years of his life Jamesone opposed the Covenant in 1639, and was sent by city fathers to seek help from the Earl Marischal. This act, not proscribed by him, was to make him an enemy of the Covenant and the Covenanters and its successor the Solemn League and Covenant. So bad was this that he was imprisoned at the Tolbooth in Edinburgh for several months – ironically very close to the place of one of his greatest achievements in 1633. It seems no surprise then, that in late 1644 and only months after the birth of his youngest daughter Mary, Jamesone was to die. An interesting twist on this fact is how did he die and the suggestion was that it was not by natural causes. A recent article on his genealogy gives an interesting proposition. By mid September 1644 it is known that James Graham the Marquis of Montrose had invaded Aberdeen (after becoming a Royalist) and forced the people to accept the Covenant. He ordered his soldiers to slaughter every man woman and child they found in the streets, and all the men they found in the houses. Family tradition apparently states that Jamesone was one of the men murdered during the massacre. This is a very intriguing possibility – but only a possibility at this stage. 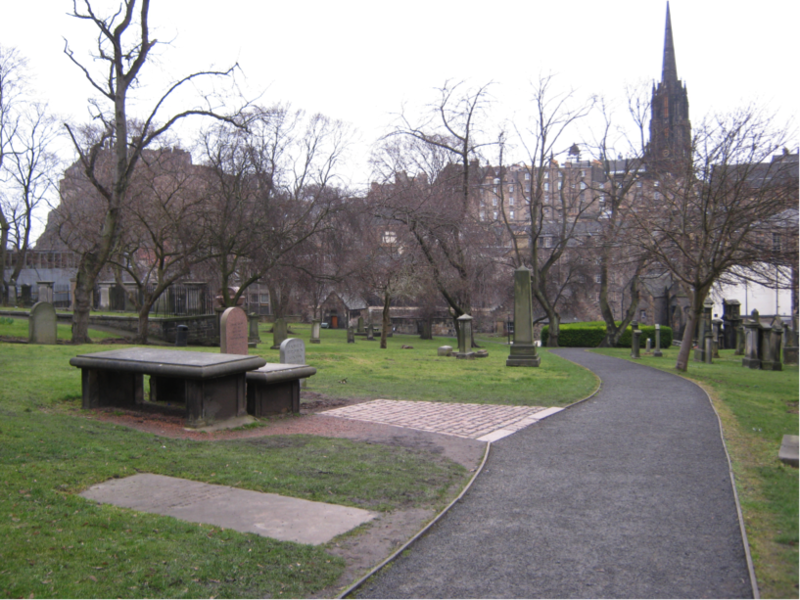 Jamesone was buried in Edinburgh, as per the instructions of his will, and with no monument, which I can testify to, as I walked through Greyfriars Kirkyard. The Kirkyard did have the distinction of yielding the monument of someone I am interested in though. Sadly not for this project! As well as his own descendants through his daughters such as Cosmo Alexander, Jamesone’s legacy also continued via the artist John Michael Wright. Thought to be of Scottish parentage, but born in London he was apprenticed to Jamesone. One of his greatest works is a portrait of Charles II in his coronation robes – an interesting parallel to Jamesone’s career. There was also a brief resurgence of interest in the mid to late 19th Century, the Society of Antiquaries in Scotland meeting in Aberdeen spark a series of newspaper articles in the years 1854-1855, and during the 1880s a lot of research was undertaken by John Bulloch a local journalist, and by 1895 a small exhibition is held in the Grafton Gallery, London of old Scottish painters. Since then and through much of the 20th Century interest has again waned. There is much about Jamesone’s life that is uncertain, what is sure though, is that through his daughters his talents were passed on through the generations as were many of his portraits. It seems less certain whether his reputation as an artist has survived well through the centuries. 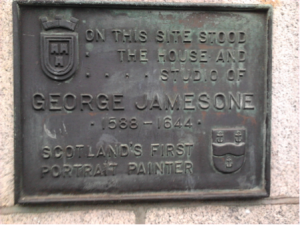 What Jamesone brought to Scotland was its first great portrait artist – something only ever before done by non-native artists. 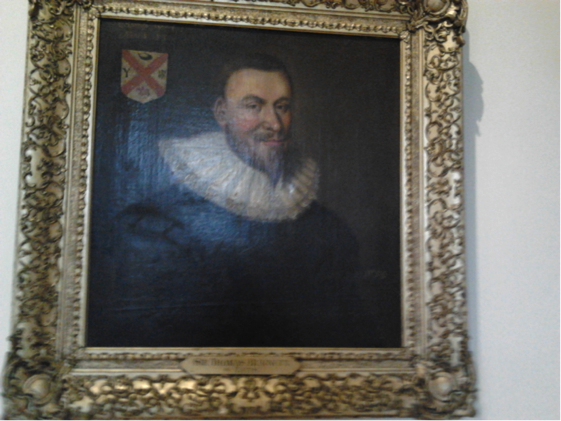 My own research journey continues, most recently to Traquair House, which contains a splendid triple portrait identified as by Jamesone as well as two other full-length portraits attributed to him. Jamesone, I have learned in life and his work is something of an enigma, and I am still unsure if he painted Andrew, Lord Fraser. May I pin this to our Magical History board on Pinterest? This is very well done. Thank you! If it’s ok with Andrea, it’s certainly fine with me.